The miracle or robbing (depending on who you ask) at midweek had put Barcelona’s woes of last month behind them, they were now the club that had their swagger back, the club that suddenly had a manager who wasn’t in the Catalan media and Barca-fan hot seat. That photo of Lionel Messi dramatically and emotionally addressing fans at the Camp Nou, clutching his badge, was soon changed to every Blaugrana fans’ cover photo on social media, but it was, in all honesty, Neymar’s brilliant form in the final stretches of that European classic that had given fans of world football a sense of something more – a sense that the team that won the treble nearly two years ago was back. But amid all the celebrations, were those who knew that the issues that plagued them as far back as their last Liga battle against Atletico Madrid weren’t going to suddenly disappear. 6-1 was the second-leg final score, but across both, it was still 6-5, the thrashing in Paris can’t be erased just because Luis Enrique’s men advanced to the next round. Issues are still there. The notion of a hangover coming into their league match against Deportivo la Coruna wasn’t on the minds of many, but Pepe Mel’s men likely preferred it that way heading into last Sunday’s match. This has been a side that has quietly enjoyed some improved results ever since the former West Brom man has taken charge, winning once and drawing twice. His hardest test, however, was about to be in the form of a Barcelona outfit that was still enjoying their historical European night. With little time to put his tactical mark on his side, Mel was likely going to analyze footage of what has made teams successful against Barcelona this season, and nothing has worked better for long periods in matches than high-pressing a Barca squad that isn’t as effective in the middle of the park. In addition, for obvious reasons, it wouldn’t have surprised many here at EAT for a new coach to also attempt a low-block and hit Barca on the break as he is really just starting to feel out his side – Mel hasn’t even been in charge for a month yet. Barcelona formation and personnel news: Luis Enrique has opted for a back-three in recent matches, with a 3-4-3/3-5-2 variation against Paris at midweek. Due to Mascherano, Pique, Jordi Alba, and Sergi Roberto being jotted on the starting XI, many thought a 4-3-3 was to return – this wasn’t the case. Masche’ was to play as right-center-back, with Pique and Alba to the left of him, accordingly. Furthermore, in the middle of the park, Denis Suarez and Andre Gomes served as wingbacks while Roberto and Busquets operated centrally. Per usual, Messi would drop into the midfield on occasion while Luis Suarez and Arda Turan stayed up top. Barca was without their Brazilian star Neymar due to an adductor issue and his compatriot Rafinha was left out with gastroenteritis. Deportivo la Coruna formation and personnel news: Pepe Mel has opted to go with a 4-2-3-1 in possession and a 4-5-1 in defense. However, while hosting the Catalan giants at the Riazor, they were without midfielder Guilherme and wingers Gael Kakuta and Marlos Moreno. Furthermore, in the screenshot above, we see that Mascherano (lower left-hand corner) is about to play the ball to Pique due to Deportivo la Coruna’s Joselu running toward him. It is clear that Barca’s backline is disconnected from their midfield due to Pepe Mel’s men using three forwards to mirror Barca’s back-three. The ball will be moved to the left and we will see Deportivo la Coruna’s block getting deeper and their 4-5-1 becoming more apparent. Above, we can see Deportivo la Coruna’s 4-5-1. Their backline (orange) is very tight and compact, while three midfielders (purple) have surrounded Messi (blue) and have forced him backward. It should be noted that they did this as quickly as possible as to leave less time for Denis Suarez and Luis Suarez to adjust their wide positions nearest to Messi. The Argentine had no time to look for his closest teammates and, as a result, ran backward. The 4-5-1 is a good system for disrupting the flow of an opponent by overloading the central areas and forcing the opposition backline to play on the ball more than they’re used to. 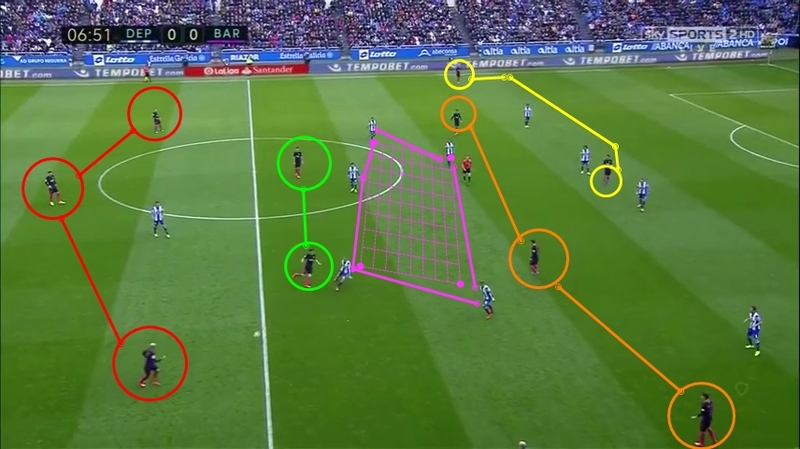 With Barcelona, this is something that they identified and thus focused their attention of trying to stretch out Deportivo’s midfield five with clever positional play and movement. Above, we also see that one player in the Deportivo midfield (purple) is about to drawn out to give Messi little room to breathe. It should be noted that Mascherano and Messi playing closely together is no accident, they are trying to get Deportivo’s midfield excited and for their block to lose organization by giving them the illusion that they’re close to winning the ball. A 4-5-1 isn’t a bad option to try and stop Barca’s build up in midfield, but it can cause confusion if one player in the five-man midfield decides to help Joselu with pressure up top, as the other remaining four aren’t used to screening and moving east to west in unison. A couple seconds after this screenshot was taken, Roberto received the ball and ran straight into the penalty area. Due to Deportivo’s midfield set up, above, we see Barcelona’s 3-4-3 has turned into a 3-2-3-2, with two pivots and three attacking midfielders working together to try and match and pull apart Deportivo la Coruna’s five-man middle (purple grid). As stated above, the 4-5-1 has its flaws, like with any formation, but it does offer a balance in terms of transitional play. As the game wore on, Barca managed to string some good plays together with a couple of chances, but the execution on goal was poor. 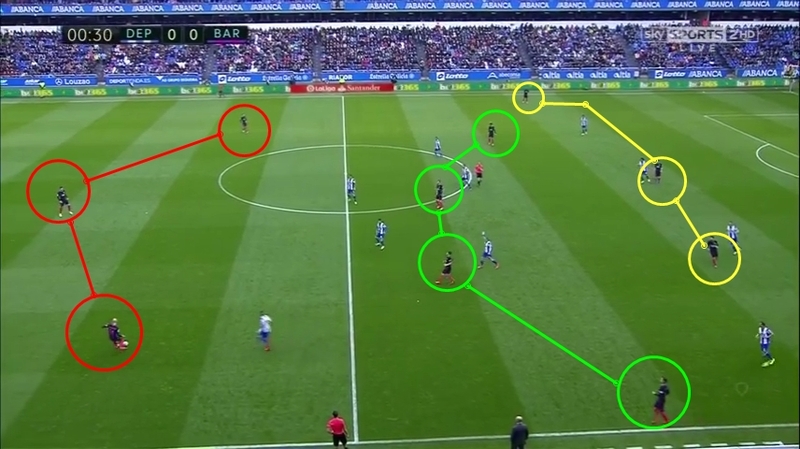 Furthermore, Deportivo’s midfield set up did offer them flexibility when transitioning from defense to attack – their 4-2-3-1 coming into further existence as the game went on. As Deportivo’s intensity picked up, so did their ability to win 50/50 balls and quickly move the play forward, utilizing the lack of width in the Barca’s backline. This caused for some stretches of play where Barca was forced to defend around their penalty area. As a result, Luis Enrique’s men were left struggling to find chances. As it happened, the veteran Argentine defender delivered a poor pass that went out of play and helped Deportivo la Coruna maintain their pressure in Barca’s half. About two minutes after Deportivo’s high-press forced Mascherano to make a mistake, Pepe Mel’s men were awarded a corner kick. With their decision to not stay compact all game, Deportivo la Coruna allowed themselves to force Barcelona to do what they’re bad at – actually defending and defensive set piece situations. Below, we see that a corner kick has resulted in Mascherano (sprawled on the ground) to try and make a last ditch clearance that ultimately lands near Marc-Andre ter Stegen and results in the German keeper losing his grip on the ball and gifting it to Joselu (orange) to finish it. The goal above put Pepe Mel’s men up 1-0 and showed that their willingness to not sit back all game, ultimately, helped them in the end. Obviously, Ter Stegen made an error on this play and contributed to Barca losing the match, but Sergi Roberto is clearly visible in the screenshot above and he doesn’t seem to take notice and put pressure on Joselu even before the clearance got to ter Stegen. Barcelona clearly suffered from a Champions League hangover – they were certainly not up for it. But even after Luis Suarez equalized in the 46th minute, you got the sense that Deportivo la Coruna was still in it to win it. With the visitors yet again forced to defend on a corner in the 74th minute, Alex Bergantinos headed in another effort after Jordi Alba failed to even jump toward a clearance. The final score read 2-1 – Pepe Mel’s outfit keeps on improving.